In a nondescript grey building, behind two PIN-code protected security doors, lies one of the Mercedes Grand Prix team's most precious secrets. The simulator has become one of the most vital tools in Formula 1 preparations. The one at Mercedes is so closely guarded that when the team invited a select group of journalists to watch Nico Rosberg at work in it, they did not even let us go into the room where it is kept. Instead, we had to watch from the control room, where eight engineers sat and pored over computer screens relaying data from the 'car', while on the wall at the front of the room a bank of eight TV screens showed Rosberg at work, what he was seeing, and his lap-time data. Of course a simulator - a kind of hyper-advanced computer game integrated with a hydraulically controlled Formula 1 car chassis - can never completely replicate the experience of a driving a grand prix car for real. It cannot, for example, produce the extreme forces experienced by a driver out on the track - nearly 6G during braking and 5G in the fast corners. Nevertheless, it is realistic enough for Rosberg to be fully kitted out in fireproof suit and, perhaps surprisingly, a helmet when he drives it. Why the helmet? "For danger," he says. "I'm strapped in for the same reason." The simulator might not be able to fully replicate the physicality of driving an F1 car, but effort is made to go as far as possible. The chassis sits on hydraulic pistons, which buck it this way and that in response to the forces the car would be experiencing out on the track. It cannot imitate prolonged acceleration, deceleration or cornering, but it does produce the initial force. 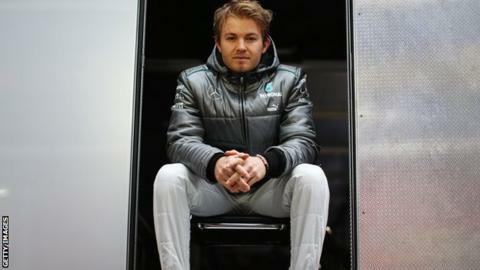 Hence Rosberg's wariness of the simulator's behaviour in the event of a crash. Rule number one in an accident for a racing driver is to take their hands off the wheel, lest it whips around on impact and causes an injury. "But I remembered a story from [former world champion Mika] Hakkinen who nearly broke his thumb in a simulator because it flicked round, you know? And so I held on but I held on lightly and it did flick and so now I just mostly let go." This is a reminder of just how different the simulator is from the many mass-market racing computer games available. "Ah, a lot - very, very far ahead," Rosberg says, "with all the feedback, making it a realistic racing car to drive. So much happening - understeer, oversteer, the change, what's going on visually, all those things." The use of the simulator in F1 started with McLaren more than a decade ago. They realised they were at a disadvantage to Ferrari, who had their own test track on which they could run the car whenever they wanted, and McLaren invested in computer technology so they could test virtually instead. The idea was to produce an F1 equivalent of the flight simulators pilots use to train. Several generations on from the first attempt, the technology has become extremely advanced and is now an essential part of any team's preparations. In fact, the wheel has now come full circle. Ferrari were caught off guard by the testing ban that was introduced a few years ago and they are widely regarded as still trying to catch up in the simulation game. The Mercedes simulator is not quite up to the level of McLaren's, new signing Lewis Hamilton said recently, but it's good enough for Rosberg, who also drove Williams's simulator when he was at the team from 2006-9, to describe it as "very realistic" and "very accurate". Now, simulation has moved on to such an extent that it has become a driver's first experience of how the car will feel in a new situation - whether that be arriving at a new track in a car he knows well or how a new car will feel when it first hits the track. Our session with Rosberg came after the new 2013 Mercedes had made its debut at the Jerez track in southern Spain last month. Rosberg 'drove' the car in the simulator both before the test to get an idea of what it would be like and afterwards to cross-reference the sensations and information. How close was the simulator to the feel of the real car, I wondered? "It was a good correlation definitely, and that's always amazing," Rosberg said with a smile. "You know, they put some new suspension [data] in there, new aero numbers and all of a sudden I feel the new car." Ahead of the season-opening Australian Grand Prix, Rosberg will not only know how the car will almost certainly feel when he hits the track at Melbourne's Albert Park on Friday, but also how he will operate its key functions - including when to use the Kers boost button for optimum lap-time effect. "For me personally, it's very useful," Rosberg says. "There's a lot of those strategic things I need to remember, like Kers boost. I need to boost in a very specific place, and so if I practise that it becomes instinct and I can move it out [of my head] and I have more space for other things, straight from the first lap when I get to Melbourne. "It helps me get there quicker. And also new tracks - its very useful to help me learn them." But there are specific features of simulators of which drivers have to be careful because it can give them - and more importantly the team - false readings about the car. For this reason, Rosberg says he always sets faster lap times on the track than in the simulator - which is often not the case for the reserve drivers who use the simulator more often than the real thing. "There's all these little secrets and so sometimes the simulator drivers who drive many, many days find all these little secrets," he says. That can give misleading information. "You need to be careful with that, yeah, for sure," Rosberg adds. "For example, if you have turn-in oversteer. You go in the simulator, I drive like the real car, [I get] turn-in oversteer. "But if you steer into the corner a little bit earlier in the simulator, and point more towards the apex, you can go around this turn-in oversteer a tiny bit, which in the real car you definitely couldn't do. "Then that's what you need to be careful about because then the comments will not be so much the turn-in oversteer, but more the understeer once you get there, or whatever." Which, if the driver and team are not careful, could lead to the engineers fixing the wrong problems, and making the car slower. Despite the small drawbacks, simulators are now more valuable than ever. With no track testing and a huge rule change being introduced for 2014 with the introduction of turbocharged engines and a fuel-efficiency formula, the simulator is where the teams and drivers can keep tabs on their progress with the new car. 'A very important thing is 2014," Rosberg says, where you can really make use of the simulator to get ahead of things to start to run the 2014 car, various things, if its set-up or even engine, the way that's going to be. "You can run that on here, and that is one of the important key things because we're not really allowed to test it on the track and it's such a big rule change. So we can use the simulator to really help us out."